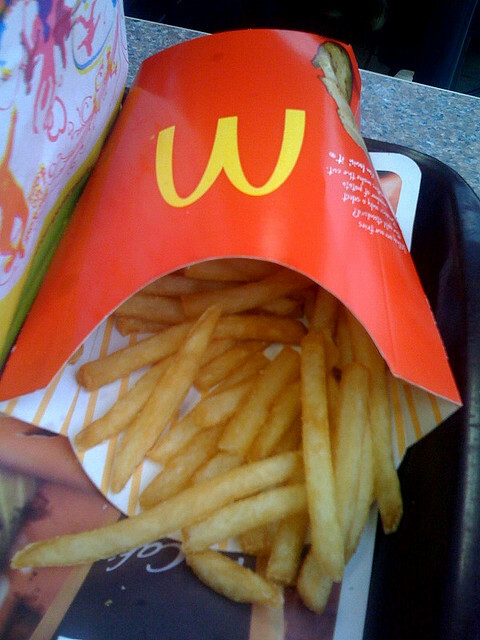 I enjoy McDonalds french fries. I don't eat out at fast food places very much nowadays but if I do then McDonalds fries are one of my guilty pleasures. Lets discuss a scenario where I buy an order of fries once a week. An individual order of fries is not very expensive is it? But if the large fries cost me $1.80 then I'm spending a total of $93.60 per year ($1.8 x 52) on the fries. If I were to save that much money every year and put it into an investment that earned 10% return annually then the money would grow significantly over time. If I did that my entire working life from age 22 to age 65 then I could save up $55,449 total. One could make the argument that the large order of fries does not cost me $1.80 but it instead costs me $55,449 in lost retirement savings over my life. In fact this kind of argument is made now and then in books, blogs or other articles when trying to show how little amounts of spending can add up to a large impact over time. Its a fairly good way of demonstrating the impact of spending over long term. You can also use it to demonstrate how saving a small amount of money regularly over time can add up to a large amount of savings at retirement. I both like and dislike this kind of argument. I like it cause it is useful lesson to demonstrate how frivolous spending on small amounts can add up over time and how easy it can be to accumulate a larger retirement savings. Its a good motivator for some people so I really shouldn't whine about it or nitpick it. To be honest, I dislike it cause honestly I just find the argument to be... well.. annoying. French fries do not cost $55,449. We all know that. Anyone telling people that is just twisting things around to make a point. You could do this with anything and everything. Your cat costs you $118,480. The better brand of tooth floss costs you $2,370. Beer costs you $432,453. It gets a little silly. Another reason I'm not fond of this kind of argument is that it bends the truth by ignoring some key details. First of all you have to think about the impacts of inflation. $55,449 is a lot of money but 43 years from now inflation will have eaten away a lot of the buying power of a dollar. If inflation averages 3% a year then prices will be about 245% higher in 43 years. That means that the $55,449 will have the buying power as just $16,022 in today's dollars. Second there is the matter of taxes. You can't assume that your money will grow over years and be tax free entirely. Its realistic to assume that your after tax dollars would be 20% less. So now the $55,449 would be more like $44,358. If you add together the impact of inflation and cut off 20% for taxes then you're talking about having an amount of money that is more like $12,818 in todays dollars. Lastly is the assumption that we used that the money would grow at 10% annually. Generally people forecast that the stock market will gain 8-12% on average over the long term. But there is certainly no guarantee of this and you're taking risk by putting your money in stocks. What if your money did grow 10% a year and then on the very last year you hit a recession and lost 40% of it? Now your $55,449 is worth $33,269 which would be only $26,615 after taxes and that would only have the buying power of $7,690 in todays dollars. Between taxes, inflation and the risks of the stock market the amount of your savings over 40+ years would be significantly lower. If an article declares your fries would add up to $55,449 then the real figure could be more like $12,818 or $7,690. Of course $7,690 or $12,818 is still a lot of money. But it is not nearly as much as $55,449. French fries don't cost you $55,449. Fries cost $1-2 generally. But adding up the lost retirement savings over time from routine purchases is still an OK way to illustrate the power of gradual retirement savings and compound interest. I just wish that such examples would be a little more realistic and count in inflation and taxes.